A few case studies are presented to illustrate the use of analytical laboratory instrumentation to identify and characterize metal can defects. Dark stains were observed on the outer surfaces of ends on tin-plated steel food cans when the cans came out of the retort sterilization system. During gentle scraping with a needle, it was determined that the stains were deposits on the surface of the clear organic protective coating. Portions of the deposits were mounted for analysis by SEM/EDS and revealed a composition mainly of iron oxide with elevated levels of calcium, chlorine and silicon. Other minor and trace elements included sodium, magnesium, aluminum, phosphorus, potassium, and zinc. It was concluded that the residues were water salts and iron corrosion products, which would be consistent with retort water residue. Apparently the retort water was not sufficiently rinsed from the cans upon exiting the retort system. These deposits, being rather loosely adhered to the surface of the coating, could easily wash off into the product when the steel ends are opened with a circumferential can opener. Drawn & Ironed (D&I) tin plated steel food cans are formed in high-speed machines using an emulsified lubricant in the tooling. The cans then go through a cleaning process and as a final step in the process, a water-soluble organic coating, known as a wash coat, is put on the outside of the cans by a flow curtain application method. Numerous consumer complaints were received in which the internal protective coating on the cans was losing adhesion and depositing into the product brine. Examination of the interior sidewalls of sample cans revealed film-like stains near the top of the cans where the adhesion failure was occurring. FTIR analysis of the stains identified them as the wash coat. In this case, some of the wash coat had migrated into the inside of the cans by capillary action during the can washing process. The internal protective coating that was applied later in the can manufacturing operation was not compatible with the wash coat. Several corrective actions had to be taken, which included some modifications to the wash coat flow curtain system and reformulations of the wash coat and internal coatings to make them more compatible for adhesion. Consumer complaints were received concerning orange/brown stains in or under the internal protective coating of tin-plated steel food cans. Optical microscopy examination revealed that the stains were underneath the coating. Polarizing filters, added to the compound microscope, revealed more optical properties of the stains as shown in Figure 1. They appeared as clusters of spherulites with black crossing lines, known as isogyre lines, and seemed, at first, like typical starch grains. The coating was carefully sliced away with a razor blade in order to expose the spherulites. SEM/EDS analysis of the exposed spherulites revealed high iron, carbon and oxygen content. In order to obtain a better identification of the spherulites, a portion of the can wall was placed into a low-temperature ashing system that removed the organic coatings exposing the spherulites, which could then be isolated and mounted for analysis by XRD. The analysis revealed that the spherulites were iron carbonate. 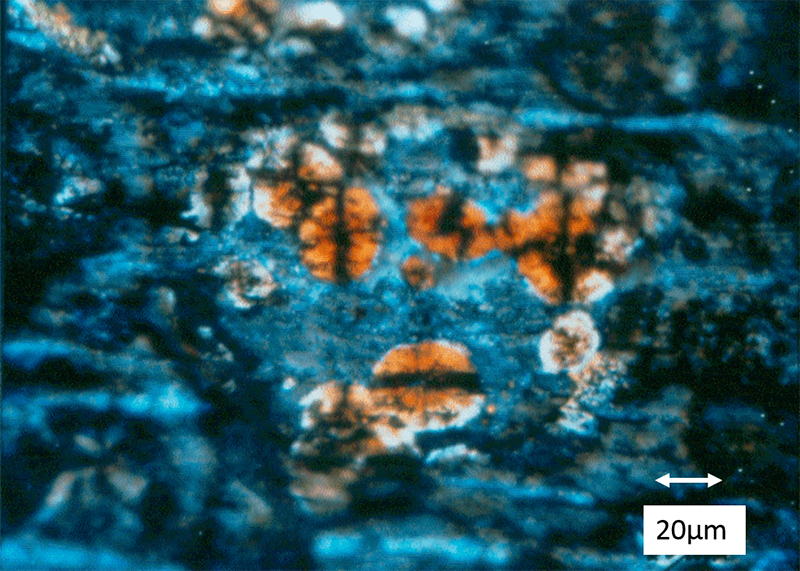 To further confirm the carbonate composition, additional spherulites were mounted on a glass microscope slide and covered with a thin glass coverslip. While observing with a stereo microscope, a drop of 1N HCl acid was placed at the side of the coverslip to wick under the coverslip to make contact with the spherulites. Upon contact with the acid, the spherulites dissolved while emitting large quantities of gaseous bubbles, which is indicative of carbon dioxide gas evolution when carbonates are dissolved in acid. Wayne D. Niemeyer is a senior research scientist at McCrone Associates, Inc., the analytical services division of The McCrone Group. He currently specializes in X-ray microanalysis of a variety of materials using energy and wavelength dispersive spectrometry methods with the scanning electron microscope and electron microprobe. Niemeyer has extensive and diverse analytical capabilities in the metal can manufacturing industry developed during a long career in a research and development environment. He began acquiring his experience working for the National Can Corporation Research and Development Laboratory in Chicago. Niemeyer also co-teaches the Scanning Electron Microscopy course at Hooke College of Applied Sciences. Contact him at wniemeyer@mccrone.com.